Warm atmosphere and unpretentious French fare at this tucked-away neighborhood café. : Make the effort to find this little French treasure and you'll be well rewarded. 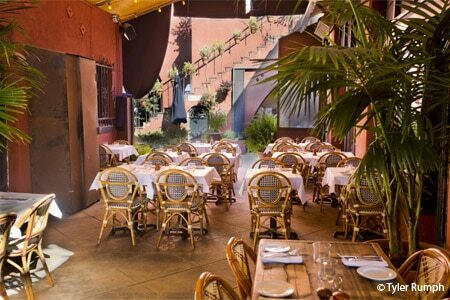 Hidden away in the courtyard of the Sunset Junction complex, where Santa Monica and Sunset Boulevards intersect, this cozy spot offers warm atmosphere and unpretentious fare. The simple menu begins with French onion soup, a must-order. The kitchen has a way with poultry: crispy duck confit comes with pistachios and cherry gastrique; and coq au vin is served atop pappardelle. Seared wild escolar with aged balsamic vinegar and garlic vinaigrette is a compelling take on a rarely seen fish. There are nightly specials, and the pot au chocolat is not to be skipped. Brunch draws a daytime crowd.